2016 marks the 950th anniversary of The Battle of Hastings and there are many related activities and events throughout the year in the town and surrounding area. The main focus of the festivities comes at the end of the summer, the ROOT1066 International Festival, which runs from September 3rd till October 16th. 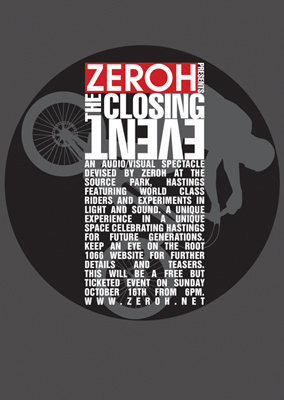 Festival Director Polly Gifford has commissioned us to create a closing event for the celebrations, for which we have chosen the recently opened Source Park, the worlds largest underground skate and BMX park, as the venue. We’re currently making plans and talking ideas through with collaborators in order to create A unique Work In Progress, the start of an ongoing wider work focusing on the Source Park. More info will be released over the next two months with hints as to what you might expect. Join us on October 16th from 6pm.